R.F. Hunter Ltd. were an importing and distribution company based at 51 Gray's Inn Road, and previously at 40 Doughty St. in Central London, England - who included various cameras, cine films and slide strips in their products. 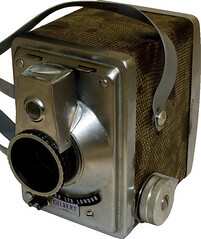 They seemed to specialise in quite odd-ball cameras, such as the gravity-control shuttered Purma and the stainless-steel fronted Gilbert box camera with rotating viewfinder. In the early 1930s, Hunter's distributed Celfix cine projectors and cameras and Hunter-rebadged Bingoscope cine projectors, and supplied films and film strips for these. 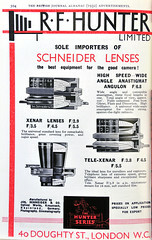 Hunter's also supplied Franka cameras and Rolleiflexes in the 1950s-60s. This page was last edited on 24 October 2017, at 10:35.